Before my son was born, the youngest kids I had painted with were 2 or 3 (cousins and niece). I've been letting my (almost) 16 month old son play with art supplies since he was about 7 months old. I was using watercolors and he seemed very interested. I let him point to the color he wanted and loaded the brush for him. He sort of just banged the brush on his paper to see what would happen and I just made sure he didn't try to eat the brush. 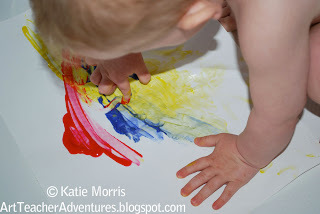 When he got over the everything-goes-in-my-mouth phase, I started letting him finger paint. 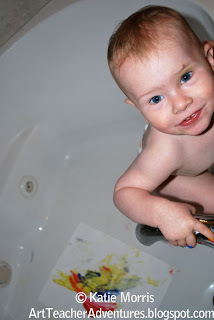 Sometimes I put paper and paint on the high chair tray, but lately we've been using the bathtub. We have a large tub so I put the paper on the floor of it and let my little guy choose his colors. He usually ends up wanting all 3. I just bought primary colors so far and I'm not super impressed with the cheap finger paint I bought, but since Art at this stage is totally about the process, discovery, and tactile/sensory experience, I don't mind too much. I've seen lots of recipes for homemade finger paint but haven't had an opportunity to try them out yet. 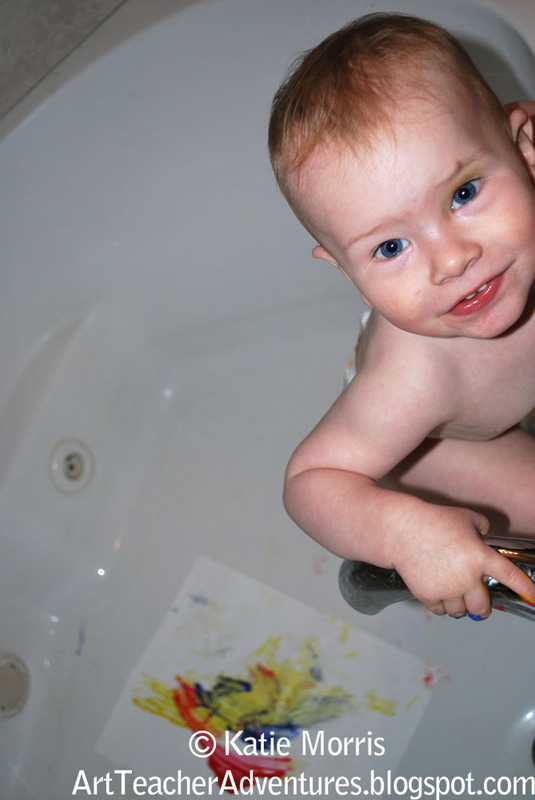 The best part is that when painting is done, all I have to do is take off the diaper and run bath water. One step to clean baby and the tub! I look forward to introducing more Art experiences in the future. I haven't tried play-doh yet as I'm not sure what the recommended age range is. There is no elementary art in our town so I know that we will be home-schooling in Art! I also discovered that when making hand or footprints, it is a whole lot easier to use a roller than a brush to cover the surface. 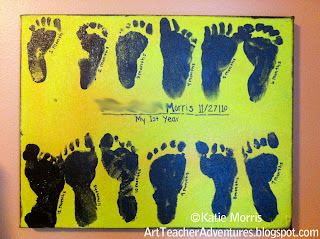 I took a footprint each month for my son's 1st year on a canvas with colors to match his room. I didn't think to try the roller until we were almost done. (You can tell I started to run out of room at the end due to his giant feet!) I think I'll redo the middle section, maybe sew some painted fabric over it since I did the writing in a hurry before his birthday party. *The blurring was done on the computer. I figure I have enough information about me on here that I should try to keep something private. I know that my readers are lovely people, but I also know there are a lot of not so lovely and honest people out there too. I actually made homemade pudding the other day and let him try it yesterday. For some reason he did NOT like the feel when it was all over his hands! I was surprised. If your son is ready for peanut butter, you can make edible play doh out of peanut butter, honey and powdered milk. Yummy and fun to play with! 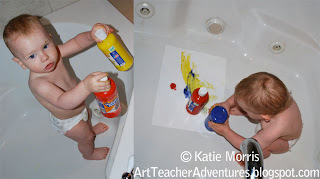 What a great idea to paint in the bathtub! It's easy to clean the mess after!